Desmond Tutu is a man I know very little about. That is until I started reading his book “God is not a Christian” as part of a book-club type evening a couple of us friends have once a week. My previous perceptions about the legend was nothing more than what I suppose most of the country, especially white people may think of him. That he is a guy that stood and still stands very strong against our previous apartheid era that ended in 1994 and that he’s been singing the same tune about all the injustices that happened back then non stop, unwilling to move on and look forward to the new South Africa. 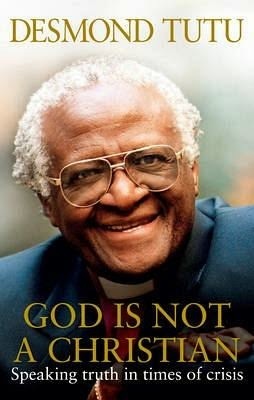 From the get go you are given a very clear and detailed intro into Desmond Tutu and how he stood strongly against all injustices world wide, not only in South Africa. He is a true rebel. He received a lot of criticism wherever he went, always stepping on toes with his relentless and direct means for peace and reconciliation. Especially during the 80’s he showed no fear when giving sermons and speeches to some of the most influential people in the world, addressing extremely large crows and telling them exactly how he thinks war, injustices and conflict should be resolved. And it is his relentlessness determination and lack of fear that must have caused him to receive the Nobel peace prize. As I am reading this book, I am truly learning more about the times when I was still a child here in South Africa, the times of apartheid. Thinking back now I can recall very little to almost none of the tremendous atrocities that our white government inflicted on back people. It is truly shocking to learn how completely horrendous that time was for black people. The knowledge of what happened back then is changing me now. I understand now. I understand what happened and why it is taking so long for true reconciliation and peace to occur in South Africa. If anything this has made me angry at the orchestrators of apartheid. Claiming “I had nothing to do with apartheid back then so why must I pay the price now” is a very short-sighted and uninformed expression. It’s like detonating a nuclear missile on a city and bitching 15 years later on why the people that were affected cant forget and forgive the culprits that caused the explosion and simply move on. While most of the survivors and affected still suffer from radiation poisoning. Now the effects of the apartheid era is much much worse than a nuclear bomb, so imagine how long it will take to repair and recover. Apart from the atrocities performed against the black people in terms of violence and gross injustices, we (white people) essentially prevented an entire race of people from getting proper education for more than 6 generations long. Now how long do you think does it take to get an entire race that has never known education, proper living conditions, and is now as a result education-less, poor and considered lower-class back on their feet? 20 years? 30 years? 60 years? The answer is a complicated one. Not even mentioning the psychological damage and hatred towards each other that is carried from one generation over to the next. Understanding the true gravity of the event and time-period will make one understand that the repercussions and consequences of that time will take MUCH longer to recover and heal, if ever. 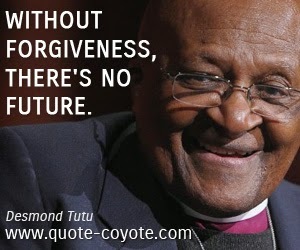 This is where Desmond Tutu is spot on with his means of how to resolve conflict, ensure peace and restore and keep reconciliation. He has the answer! I will probably update or write another post on this as I am continuing my reading with the book… but as for now… I am loving it.